Choanal atresia is a life threatening birth defect in which the nasal passage does not properly develop during prenatal life. 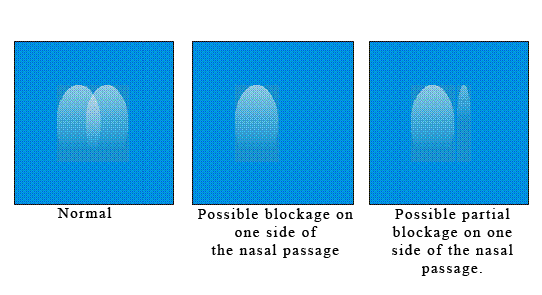 During the sixth week of pregnancy, a membrane fails to properly develop thus an obstruction occurs in the nasal passage. This is a life-threatening event because infants are obligate nose breathers. It may take 6-12 weeks for a newborn to develop the ability to breathe through its’ mouth. The first recorded case of choanal atresia was in 1755, and the first surgical intervention was performed in 1857. Choanal Atresia is one of the least known birth defects with an occurrence of one in every 5,000-8,000 births(approximately 600-800 babies each year in the United States). There are two forms of choanal atresia, bilateral and unilateral atresia. Unilateral choanal atresia is less threatening to a newborn because the nasal passage is only blocked on one side. This allows an infant to breathe some what normally at birth, but a mucus discharge is noticeable in the affected side of the nose. 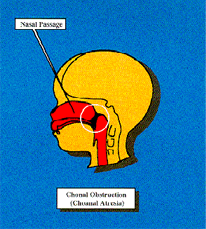 Bilateral choanal atresia is a blockage of both sides of the nasal passage. This is life threatening because the baby cannot breathe at birth. Crying allows the child to breathe until the infant discovers that it can breathe through its’ mouth. A tube is placed in the child’s mouth and tapedin place to allow for an air passage. How can I tell if my child has Choanal Atresia? There is a simple way in which a parent can check to see if their child has choanal atresia. Hold your child up to a windowpane so that their nose is inches away from the window. As they look out to watch the birds and things, look at the pattern of mist on the windowpane caused by their breathing. Infants 8 weeks and under are obligate nose breathers and should leave a mist breathing pattern in front of their nose. If your infant is breathing through their mouth, there may be a breathing problem. Below is an idea of what the nasal mist pattern should look like. If there appears to be a narrow mist pattern, check again at a later time. One side or the other may have a bit of congestion. If the pattern persist contact your pediatrician to make sure no problems are present. A narrow or small mist pattern may indicate the nasal passage is narrow and require corrective surgery. Follow your doctor’s advice on treatment recommendations. You can also check your child’s breathing by placing a small compact mirror in front of their nose as they sleep. Watch for the same mist patterns as shown above. Can Choanal Atresia Be Prevented? Not knowing what causes choanal atresia is a hindrance to developing preventive measures. There seems to be very little study done on choanal atresia. How Is Choanal Atresia Treated? During delivery the presence of unilateral atresia is not readily noticeable. Only after a catheter is inserted in the nasal passage can the obstruction be detected. Bilateral atresia is immediately noticeable due to the inability of the newborn to breathe. The inability to pass a catheter through both nostrils into the pharyngeal area will usually substantiate the diagnosis. At this point, emergent care is taken by inserting an oral air way which relieves the respiratory distress, because the mouth is kept open with the help of a tube taped in place. This procedure allows the child to breathe until the infant is stable enough to perform surgical intervention (several days to several weeks). Surgery is usually postponed until the infant has gained weight and is at a lower surgical and anesthetic risk. Several different surgical approaches can be used in removing the atresia. A cross-formed incision is made in the anterior membrane covering the atretic bone. The bone is then removed with the help of a burr, attached to a drill, to puncture and widen the opening, thus allowing for nasal airflow. A stent made of surgical tubing is then inserted and tied in place with a string. Care must be taken during this procedure to keep from puncturing the spinal cord lying posterior to the atresia. Once an opening has been established and widened sufficiently, a tube is inserted and positioned. These nasal stents can remain in place for up to a year. During this time, periodic attempts can be made to remove the stents with the possibility that the atresia may not reoccur. If the nasal passage becomes closed again, new surgery will be required to reopen the nasal passage. Recurring blockage can be noticed within days of stent removal. The stents may remain in place from several weeks to several months. What About Post Surgical Care? Once surgery has been performed, the child remains in the hospital for several days. During this time, parents are instructed on the home care techniques of caring for their child. The tubes that are inserted in the nasal passage need continuous care, attention must be given to keep the airway clear of obstruction. This will require close monitoring 24 hours a day. Usually, every two hours or so the stents must be cleaned with a saline solution and suctioned to clear away mucus. This is done by placing a catheter, which is attached to a suction machine, in and around the stent. This process can be extremely traumatizing to both child and parents, and support agencies or groups should be included in this care.